Telangana State Christian Minorities Finance Corparation, Minorities Welfare Department and Andhra Pradesh State Christian Minorities Finance Corporation will be issued Certain Instructions and Guidelines every year to the both states of all district educational officers. In this regarding TCMFC and APCMFC will inform to the district officials about Pre Matrict Scholarships. 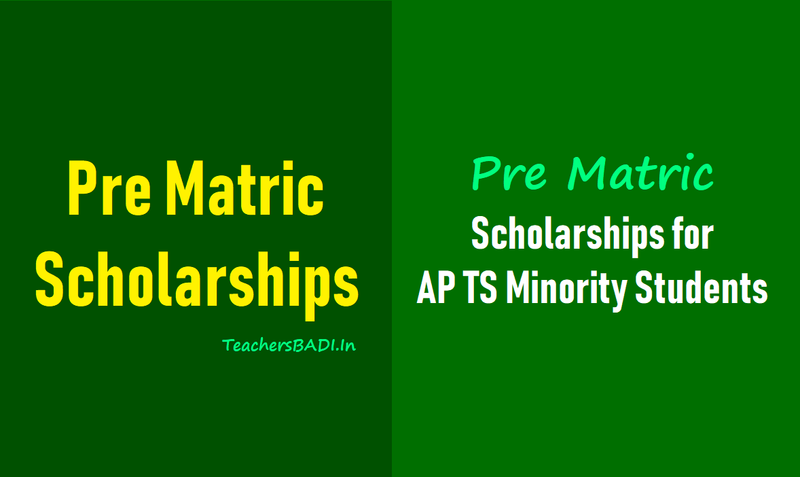 The Government Of India, Ministry of Minority Affairs will be announced dates every year for Pre-Matric Scholarships for all Minority Students including Christian Minority students and these details will be forwarded to the DEO's and concerned district's all MEO's and all schools. In this subject all eligible students of both state can apply through online mode at its official website as per announced schedule. Here we providded pre matric scholarships details only. When the dates will be announced by the Govt. of India, that dates will be provided here. All the Christian students studying in Government/Private schools are eligible for the Govt. Of India Pre-Matric Scholarship. The income limit for the parental should be below one lakh per annum.Income Certificate or Income Declaration (affidavit on non-judicial stamp paper of RS. 10/- for self employed parents/guardian) or income certificate from the employer for employed parents/guardian. The scholarship amount is upto Rs.5000/- per student. All the Christian Minority students should apply through online mode at official websiie www.christianminorities.ap.nic.in. After applying online, the hard copy and all required below mentioned enclosures should be sent to the 0/o the Executive Director (Minorities Welfare) of the concerned district. It is necessary to fill all the * marked fields in the application forms (otherwise the application will not be accepted). Annual income of parent /Guardian of the applicant should be below Rs.1.00 lakh. Income Declaration by the Parent/Gaurdian in the Prescribed Format Shall be Enclosed along with application form. The Student must obtain not less than 50% marks in the previous Class (Examination). Enter your UIDAI (AADHAAR) / EID Number in Online Application Form. Enter your Bank A/C details. Obtain a print out of the filled in application form , enclose all the copies of required documents and submit the same in the institution (School) where the Student is Studying. Mere online registration of application without submission of hard copies with necessary enclosures with in stipulated date does not confer any right to the student for sanction. Sanction of scholarship under GOI scholarship scheme is subject to target allotted to the state considering entire state as single unit. The HeadMaster of the School Should Collect all the Applications from the Students applied, Prepare a Booklet and submit in the office of the Executive Director Minorities Department of respective District. Previous Class Progress report Xerox attested by the Principal are required. District Officials will communicate the above mentioned information to all the MEO's and all the Schools (Both Private and Govt.) also that large number of poor Christian Minority Students can get Govt. of India Pre-Matric Scholarship.